Still Life Online » What's Under the Needle? It's pretty exciting what you can do with a little effort. Here are a few of the ones I've made in the past. Many of the templates are included in my workshop so why not join in the fun? In the workshop, we begin by learning to make templates from a photo, which I have supplied or you may use your own design. Step by step instructions guide you on how to do this with ease using the free graphic program, GIMP. 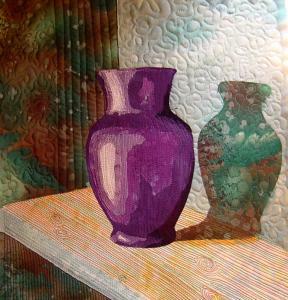 Use graduates of color to create dimension in your still life and then enhance it with thread work. 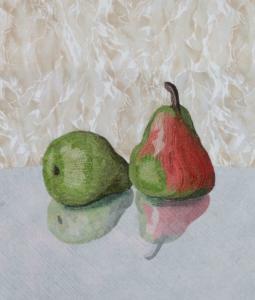 Our final lesson includes enhanced features that you can add to your still life images such as shadows and reflections. 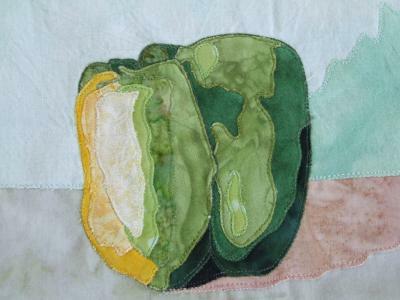 We attach your still life form to a suitable background and then finish it off by stretching it over stretcher bars or bind it off like a regular quilt.